I was alerted to this by a co-worker the other day. So when I had a moment over the weekend, I drove into the city, to the corner of North Avenue and Greenmount to check it out myself. Then I drove around a bit. These signs are up on nearly every street corner in some lower-income parts of Baltimore right now. I couldn’t wrap my head around this idea when I first heard about it, but now that I’ve seen that sign (and many others), something is really bothering me. So I did some research. I found that companies buying test strips, then reselling them, is nothing new. It’s also legal, if whoever is reselling the strips has FDA approval to do so. In fact, Diabetes Mine did an important story on this almost two years ago (they get quoted about once a week here, and twice on weeks with days ending in Y). Mike Lawson did the investigating and wrote the story, and it gave me chills. It also had me asking questions. Questions like: What kind of screwed up healthcare system do we have in America, when people who need help have trouble getting it, and people who prey on others with very little cash can operate with impunity? How does all of this work? What kind of profit is there in this? Well, the money must be good at least. Because there are dozens of sites online that will buy up your test strips. And then resell them. Some are operated by individuals, some by actual companies. As I mentioned, I’m very distressed by the presence of these signs in my community. 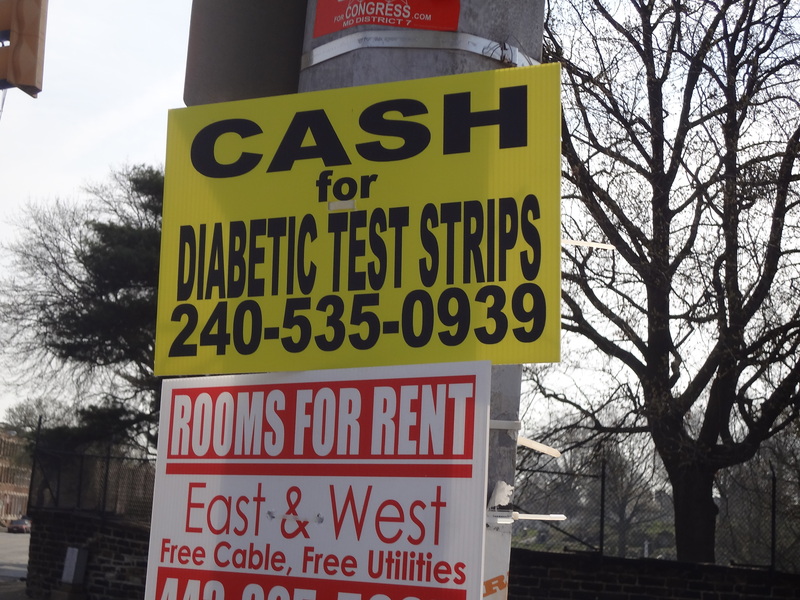 I absolutely hate the idea that people with very little will feel the need to take shortcuts on their diabetes management just so they can pay the light bill. It makes my heart hurt. I feel like there must be a special place in hell for people who exploit this kind of weakness. Rather than helping someone who may really need it, they’re helping themselves to profits on the backs of those who can least afford it, financially or physically. So I think I’m going to see what I can find out about the organization behind the phone number and the cheesy signs. I can’t really consider myself an “investigative reporter” type. I don’t have any idea what I’ll find out, if anything. But I can’t let go of this yet.